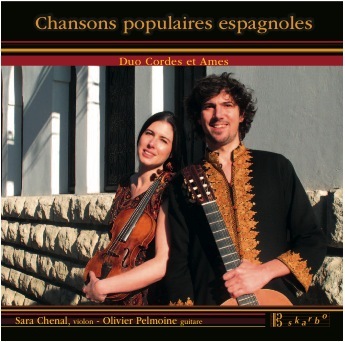 High standards and eclecticism on the one hand, force and refinement on the other, certainly characterise the spirit of the "Cordes et âmes" duo. Vibrant, sensual playing, served by perfect instrumental technique and obvious complicity are so many elements contributing to the alchemy of a successful duo that communicates particularly well with the audience. 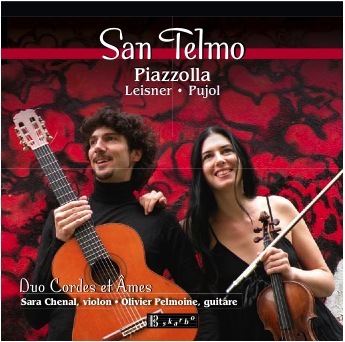 Formed in 2001, a year later the duo won two international chamber music competitions, before obtaining its prix in chamber music with honours at the Paris Conservatoire in 2005. It then embarked, artfully and enthusiastically, on a custom-made repertoire, existent or to be created, enriched by improvisation and its own transcriptions, and featuring music from all eras and horizons: early, Classical, or contemporary, from Eastern Europe, Spain or South America. 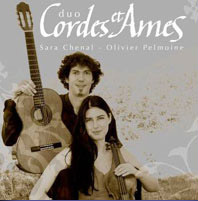 Benefiting from the experience of more than 500 concerts in France and abroad (Italy, Spain, Germany, Africa, India, Japan, the Philippines, Canada, the Caribbean, Greenland), violinist Sara Chenal and guitarist Olivier Pelmoine excel on stage, where their collaboration offers us a fine musical presence and a rare harmony (in all senses of the word): a duo of bodies and souls. 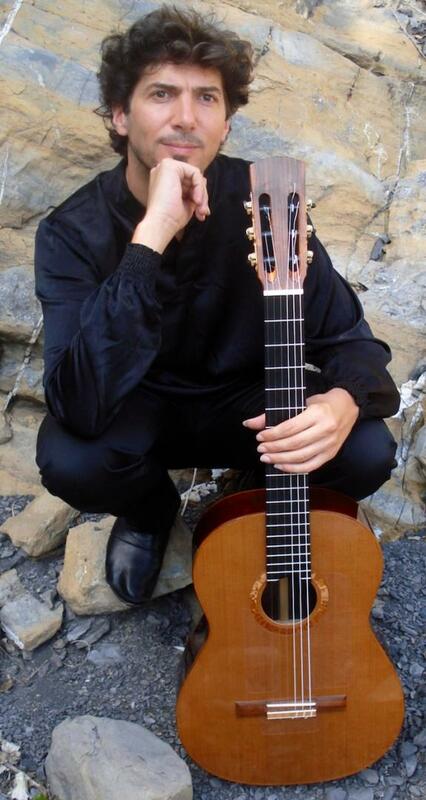 A former student of the Conservatoire National Supérieur de Musique de Paris (First Prize with Honours), and the Ecole Normale de Musique de Paris (a unanimous Higher Diploma for performers), Olivier PELMOINE was the winner of the Festival International de Guitare held in Montpellier in 2000 for rising talents. He also obtained prizes at two international competitions in 2002 in Ville d’Avray (in honour of Maurice Ohana) and the Ile de Ré. 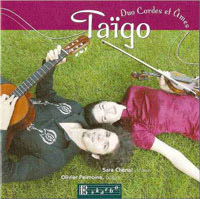 His CD recorded in 2005 – devoted to works by Rodrigo, Regondi, Barrios, Albert and Boutros – was unanimously praised by critics. Olivier PELMOINE has many varied activities in his own field: he plays as a soloist, in chamber music groups, or as guest performer with several orchestras. 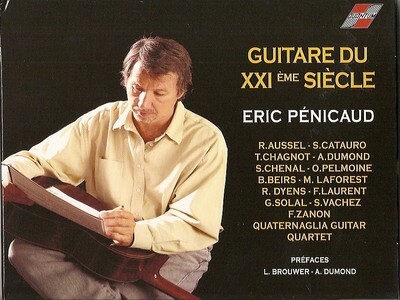 He teaches guitar at the Dijon Conservatory and the Burgundy graduate school. He regularly gives master classes (France, Italy, Tunisia, Nigeria). A violinist, she won a first prize with distinction at the Conservatoire National Supérieur de Musique of LYON in 2003. She then attended advanced violin classes at the Rotterdam Conservatorium. A member of the Opéra de Dijon from 1996 to 2001, she then turned to chamber music, first in a string and piano trio, then as member of the “Cordes et Ames” Duet, as well as with the “Sine Qua Non” string quartet where she has performed as leader since 2006.She is frequently the guest of various chamber music festivals and performs as soloist with such ensembles as J.W.Audoli, Forum Sinfonietta, Les Musiciens d’Art or Musica de Flandres…Very interested in contemporary music, she frequently plays with well-known artists such as Marc Perrone or Emilie Simon. She currently holds a teaching post (violin) at the Conservatoire à Rayonnement Régional de Nantes and she regularly gives master classes (France,Tunisia, Nigeria).